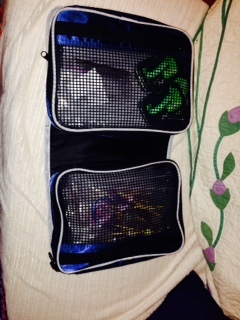 However, I have not been idle! 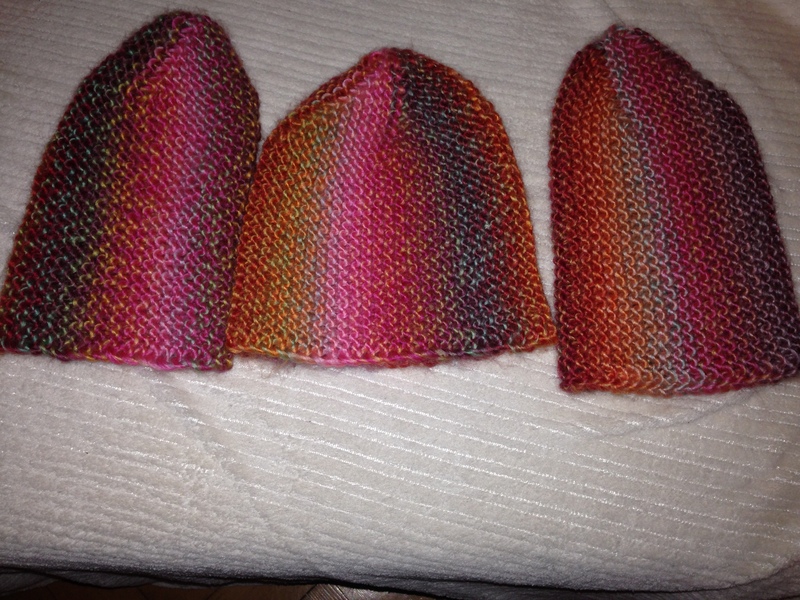 I’ve been knitting for charity…. 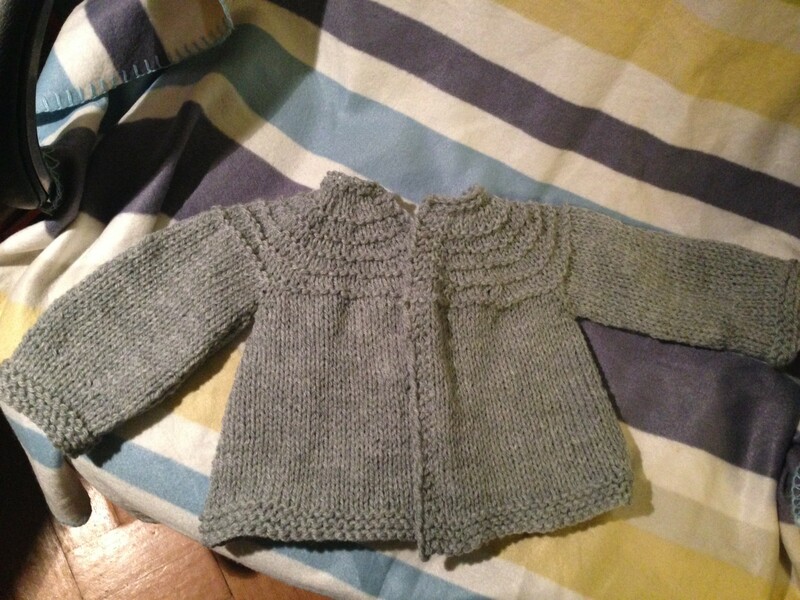 Another of the marvelous Surplice jackets, E Zimmerman’s pattern made with stash yarn, as were these – a Five Hour baby coat , another jumper and various hats and scarves… . 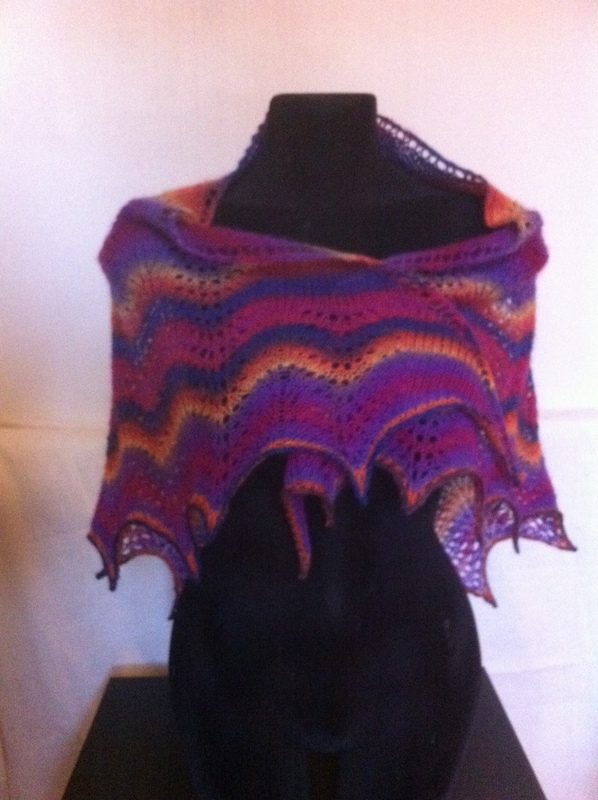 I also made a shawl for me (which is fairly rare!) . 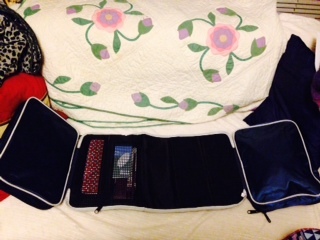 Over the holidays, I’m trying to get a bit more organised… taking a cue from lovely people on Ravelry and also a few other places, I got a fisherman’s rig wallet – it’s amazing! 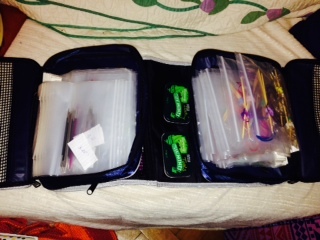 It holds all of my circular needles, and all of my interchangeables, and cords – and all my crochet hooks, and stitch markers and everything! 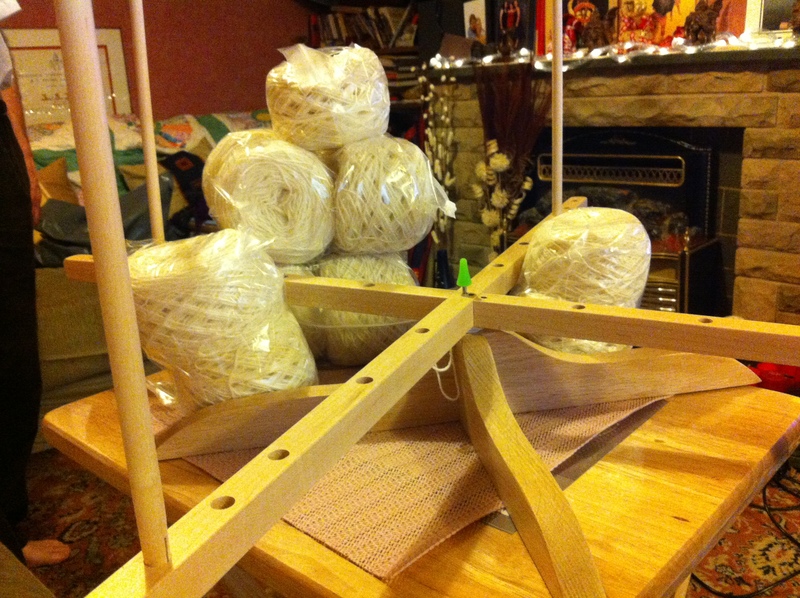 It’s not small (it’s pictured on a two seater sofa, for scale) but it’s going to be very handy! 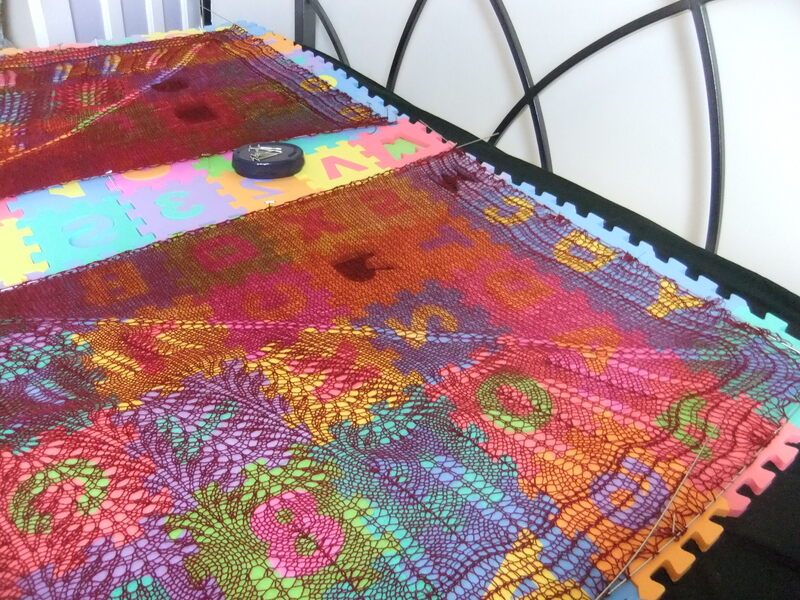 You may remember that I was making a scrumptious shawl – the lace is called scrumptious. 🙂 There’s a post about it here. 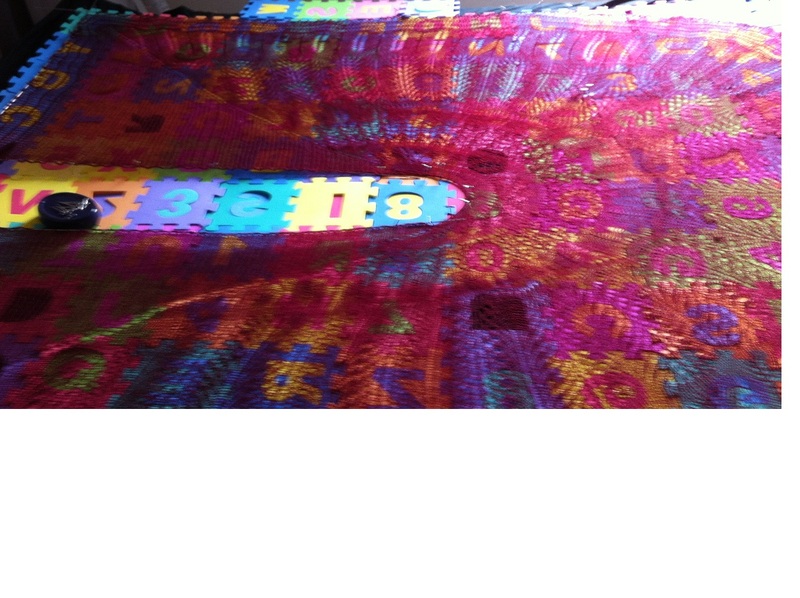 Well, FINALLY, I got round to blocking it today! 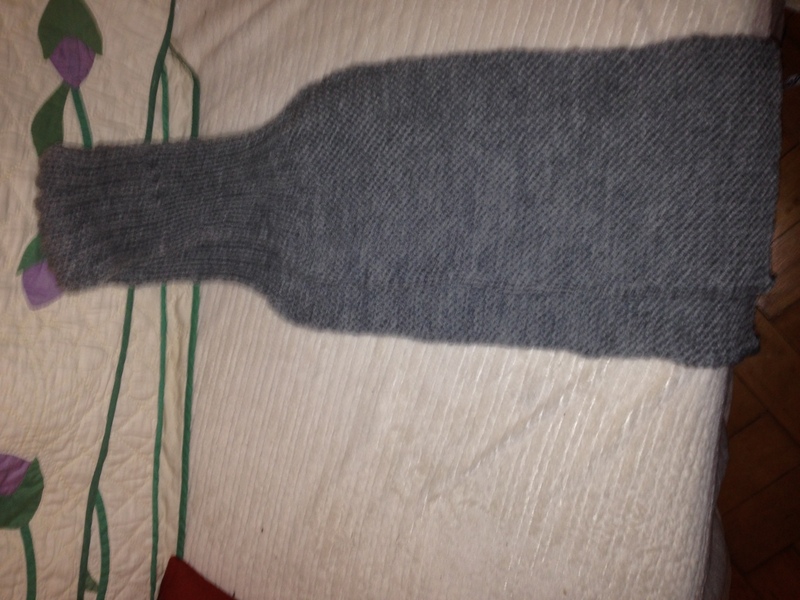 It’s drying as I type… I was worried it might be too small, but, um, well… That’s on a king size bed! 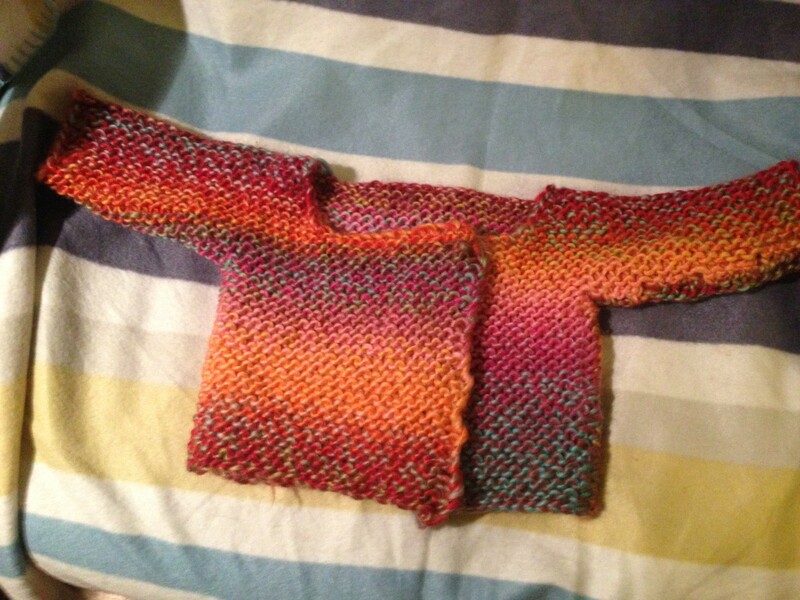 Once you have wound what seems to be an ocean’s worth of wool, you end up with something very pretty and amazing, like this: Isn’t that fantastic? 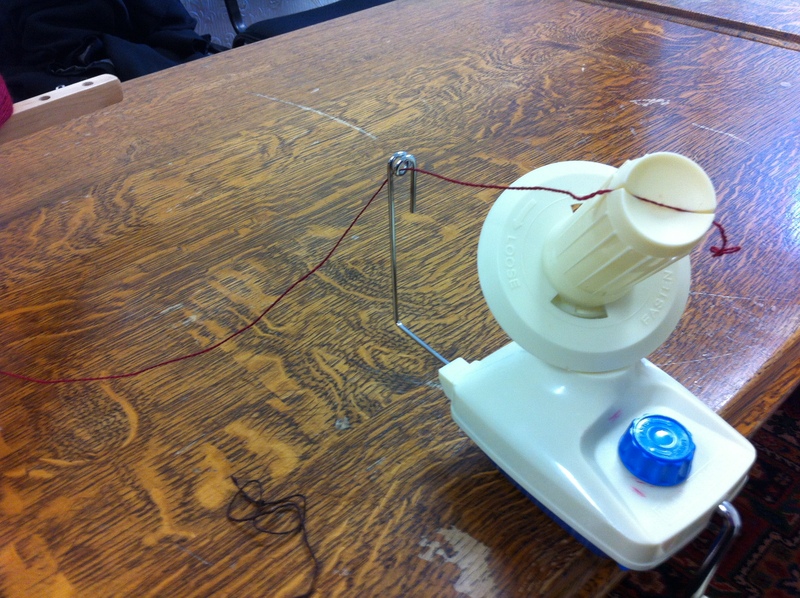 And all I had to do was turn the handle – all that fancy winding got done automatically! 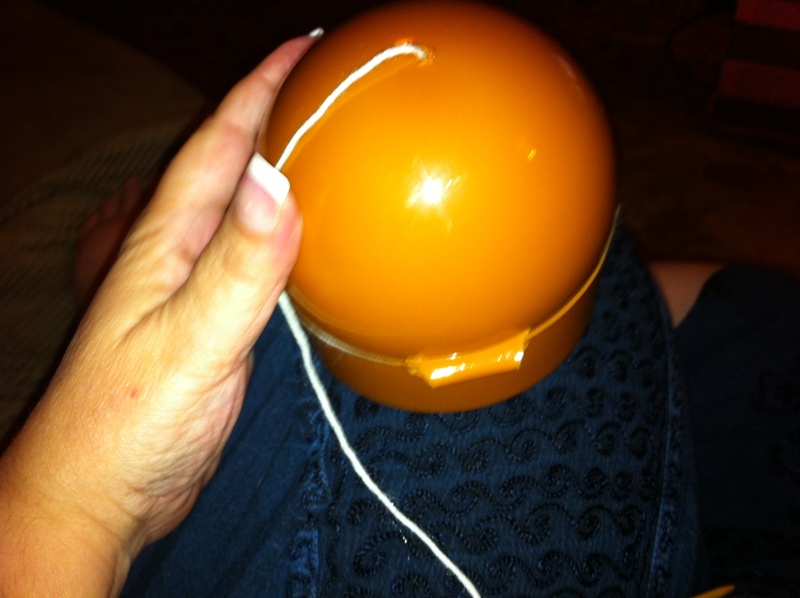 Lift the yarn ball (often called a cake) off the winder, drag the original bit of wool out of the centre, and you’re off! 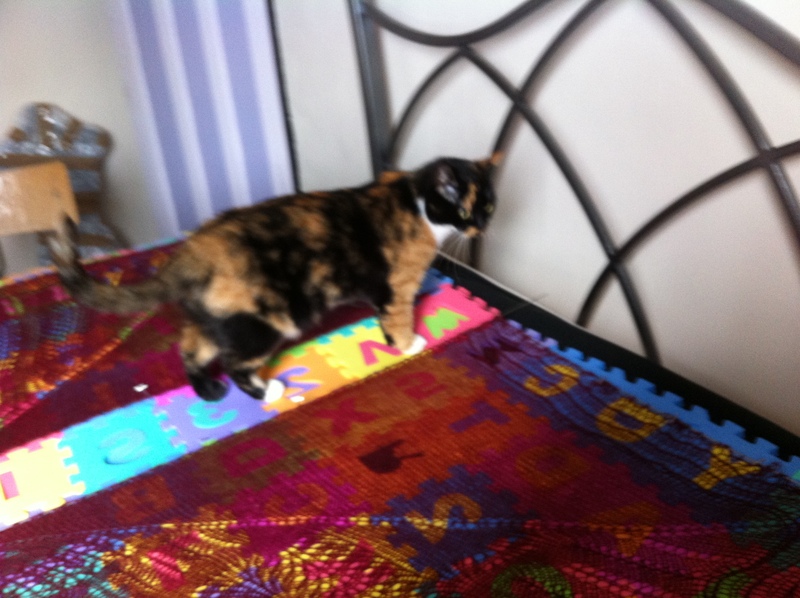 If you’ve not got a swift, you can substitute a couple of chairs or a willing accomplice (ply accomplice with tea and cake but not too much tea – you don’t want them having to run to the loo part way through!). 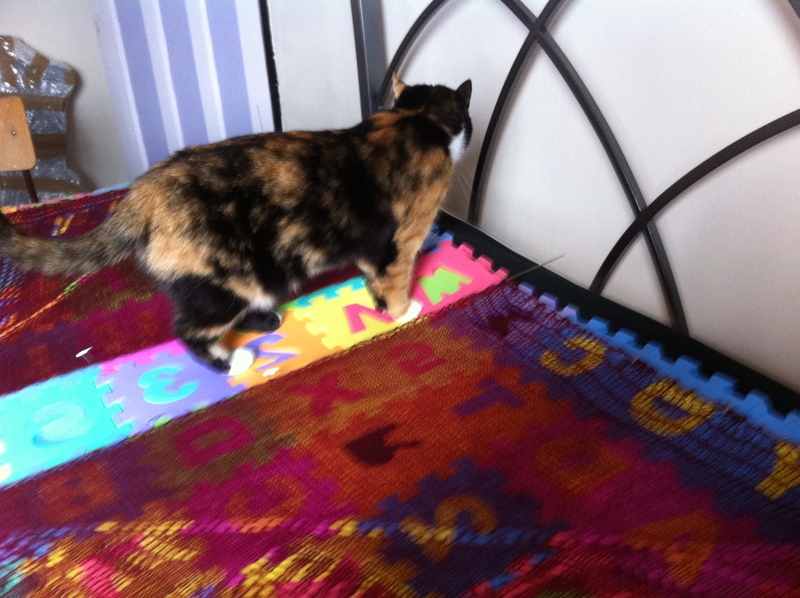 And no cake till after (crumbs – not a good look in a ball of wool). If you don’t have a swift and are thinking about getting one, I can’t recommend these people highly enough – the Oregon Woodworker. 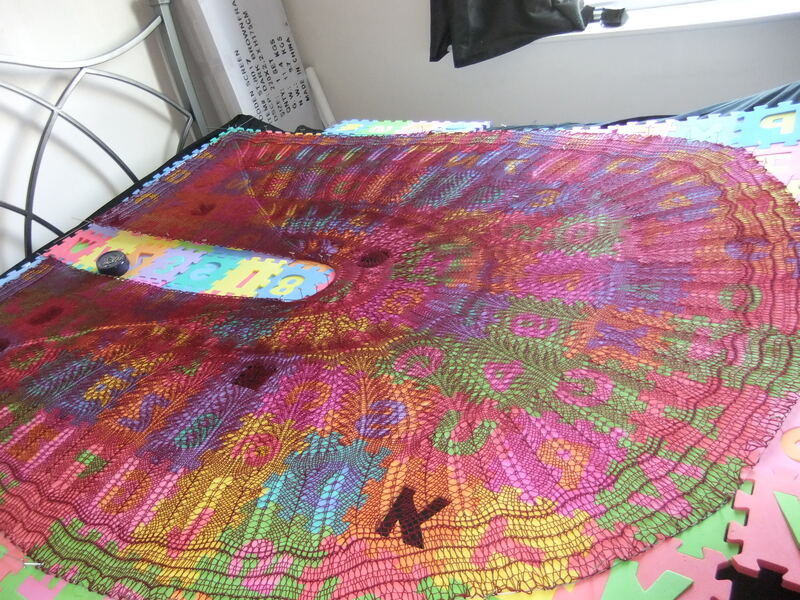 The shawl, predictably, will take a bit more time…. 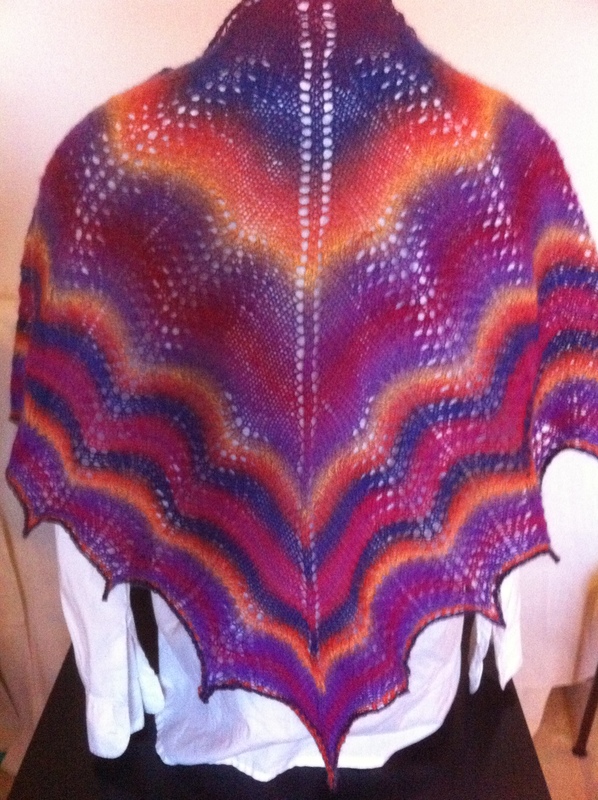 Well, the shawl is finished and up for sale; I think it looks quite good (better against that white shirt!). 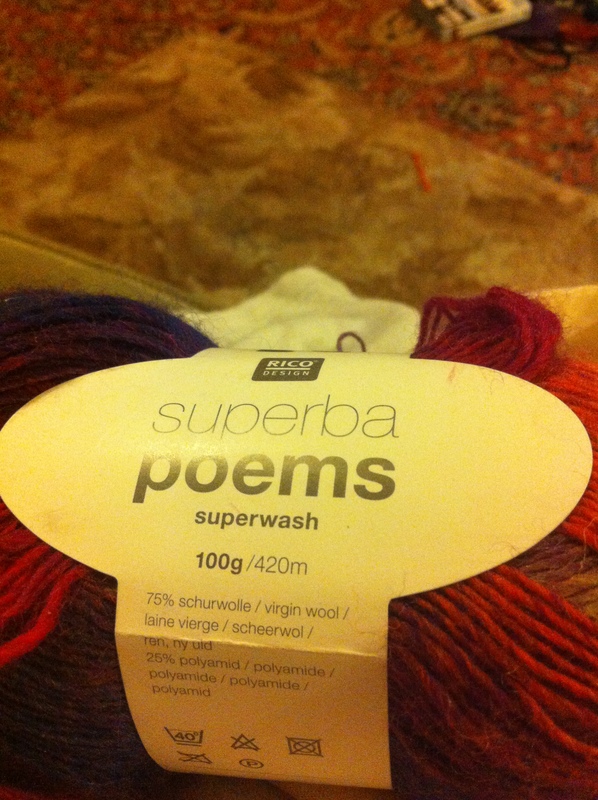 It’s made from Rico Designs Superba Poems, which looks like this: . 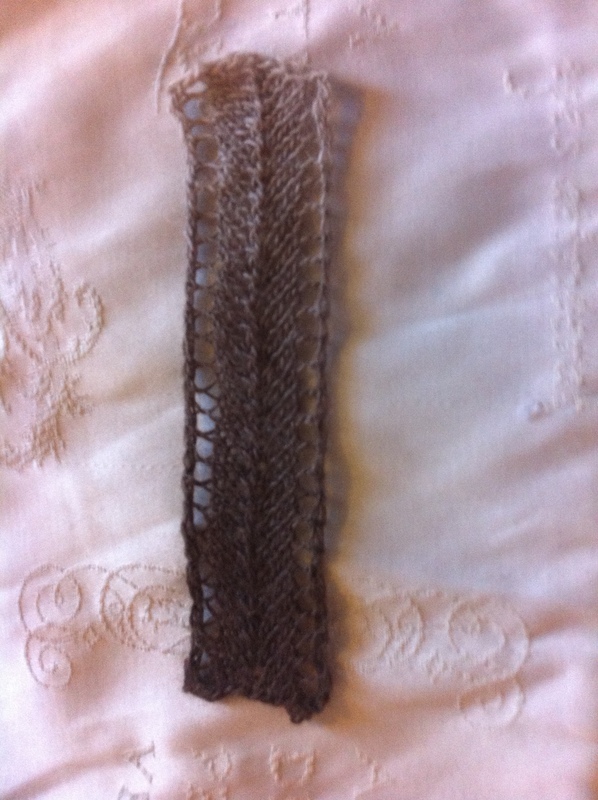 I’ve also made a small bookmark (7 inches) out of some left over Lace Ball, and blocking it looked frankly ridiculous: . 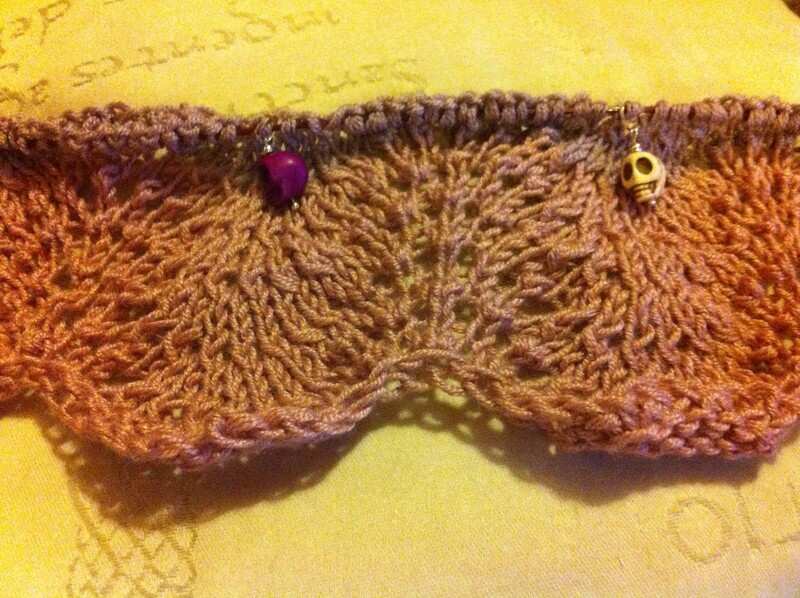 But the final object is nice, for a rugged sort of bookmark (for tough going reading?). . 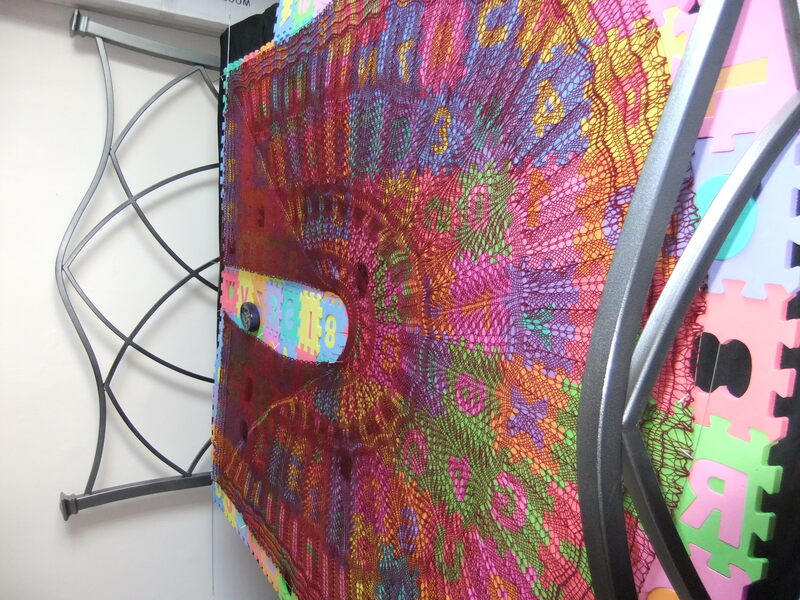 And I have found another wonderful aid to this whole project – I remembered that my mother had a pin holder thing that was magnetic. 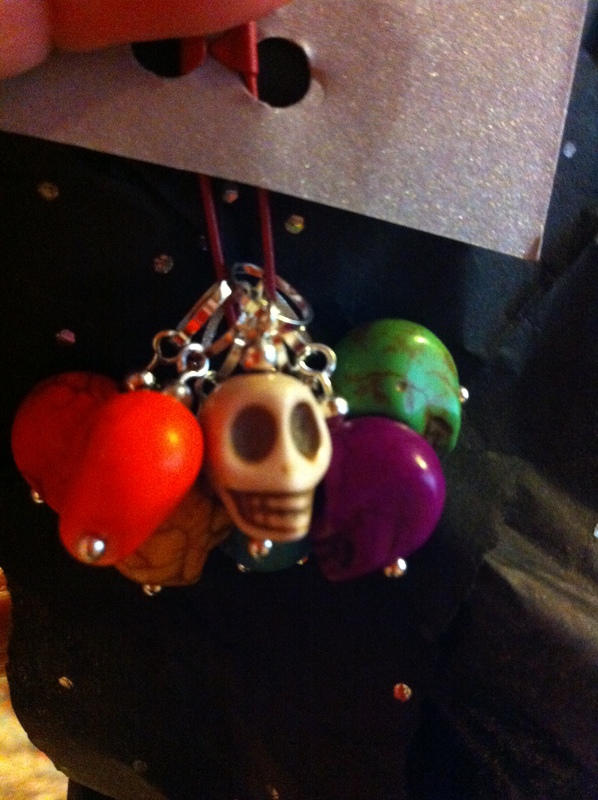 Having shopped around (and refusing to pay £14! 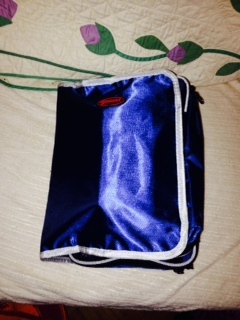 ), I found one at HobbyCraft – and it’s saving me a great deal of time! 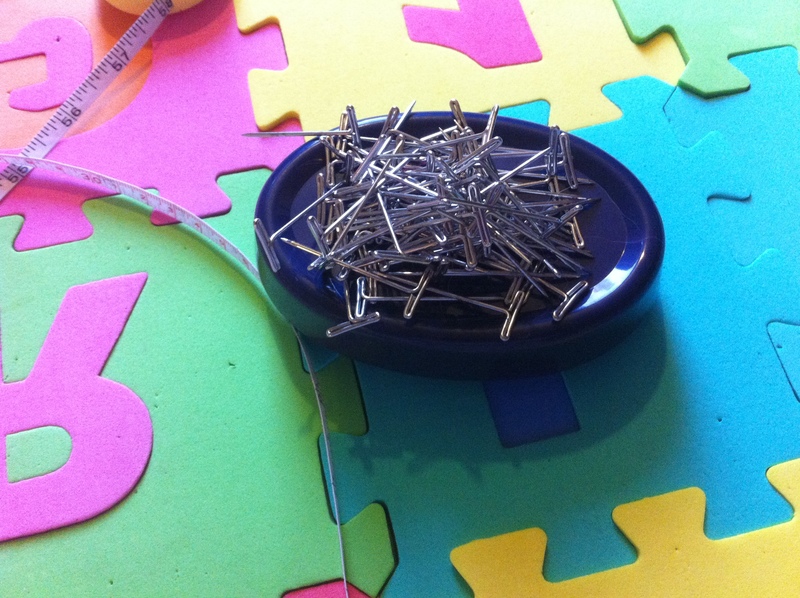 You just get the pins in its general direction and it grabs them and *holds them* – hurrah! 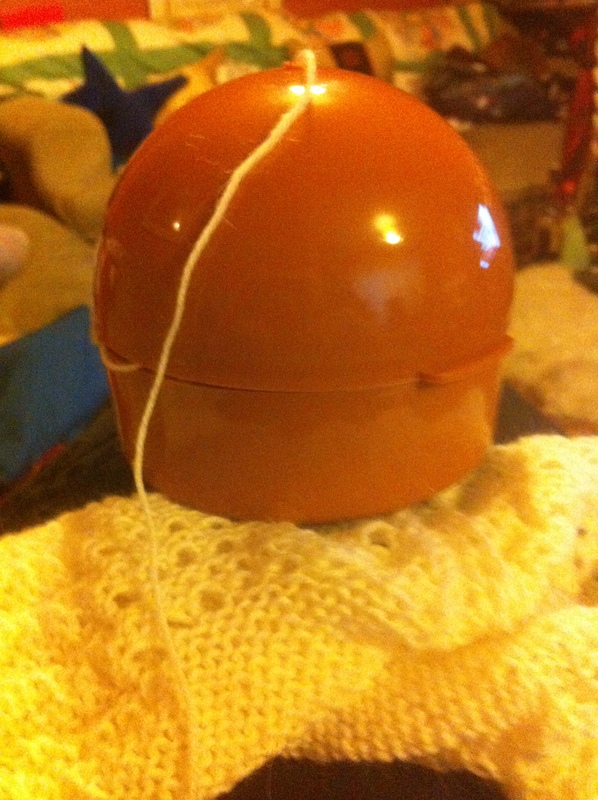 However, if you stick a hole in the top of it (carefully!! 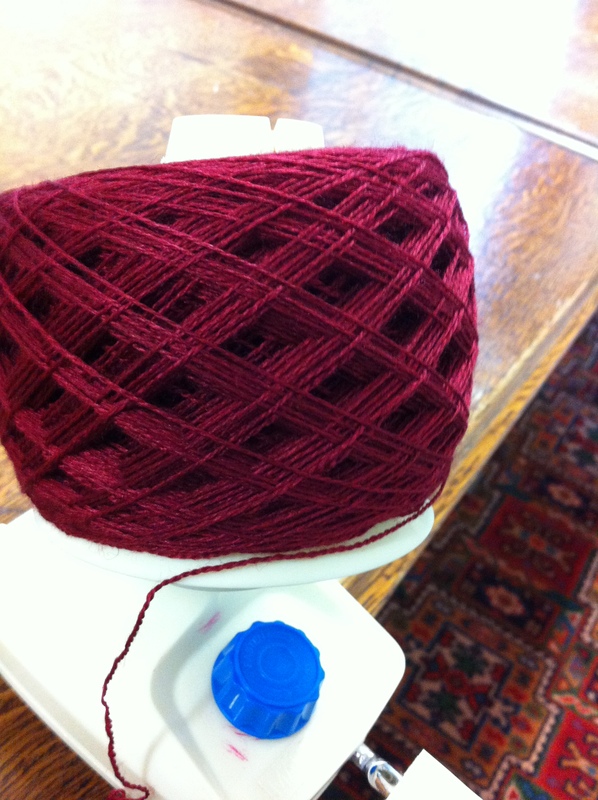 And don’t try this at home…), you can put cakes of wool in the keeper, and thread the wool through it and voila! 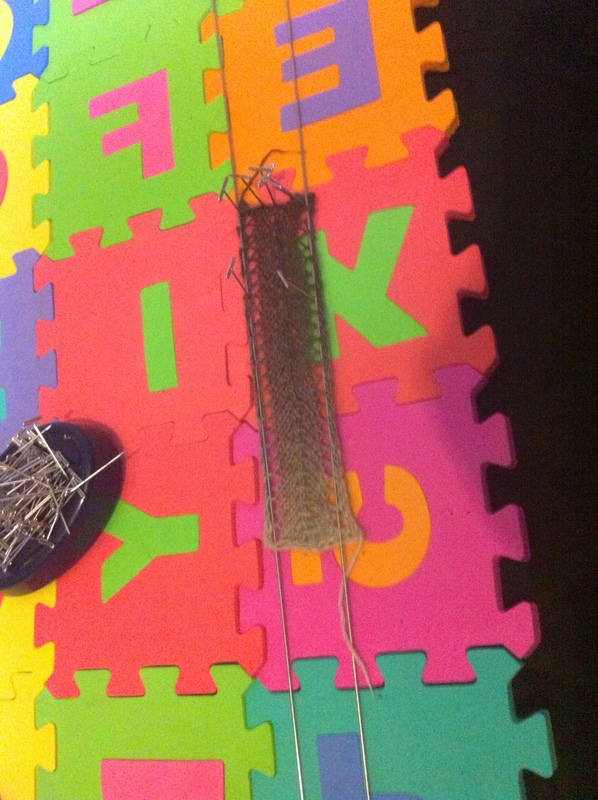 It ends up looking something like these pictures…. 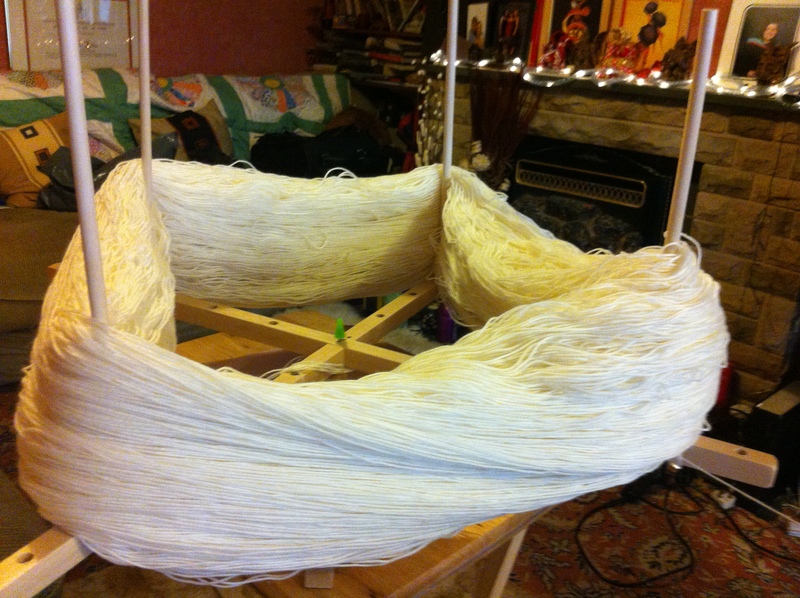 New swift – and a KILO of wool! 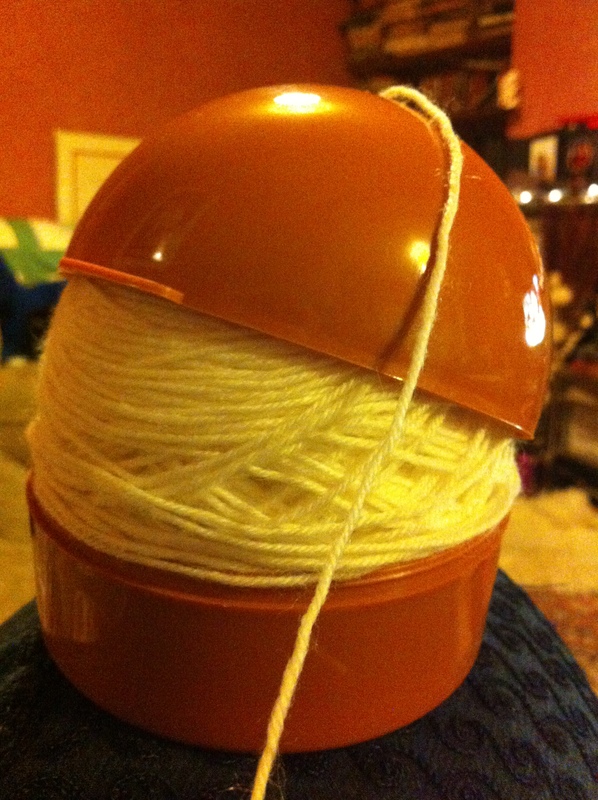 While at Woolfest, I bought a kilo – a KILO – (2.2 lbs) of 3 ply, pure new British wool. 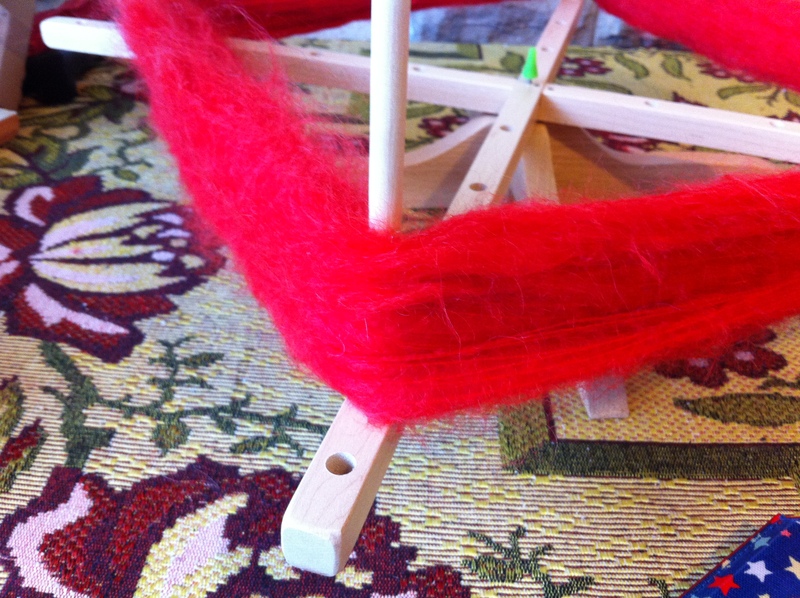 When I tried it on my usual swift, the wool just fell off – the swift couldn’t cope. So, I looked around, and I ended up buying a Mama Bear Plus swift from these good people. 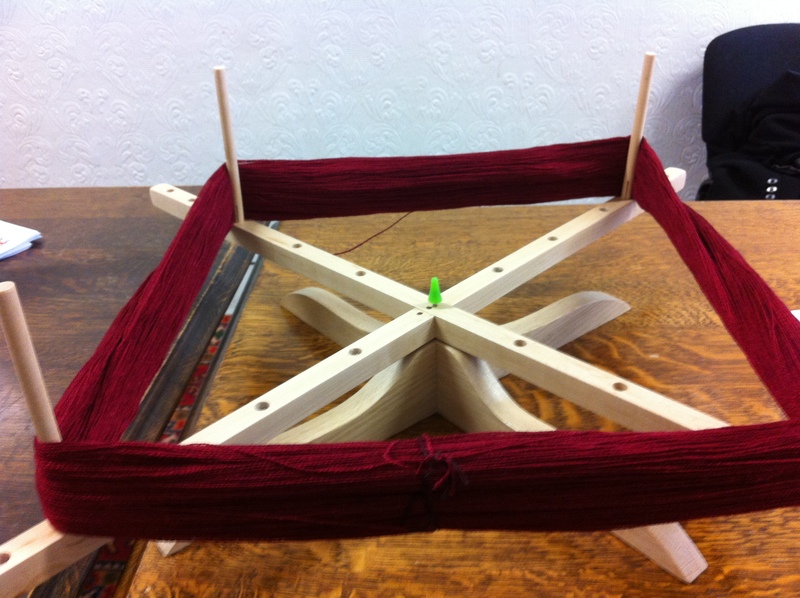 I was going to buy the bigger one but they talked me out of it and told me this would be sufficient for my needs – and even threw in longer poles for holding the skein (as in, the upright ones). 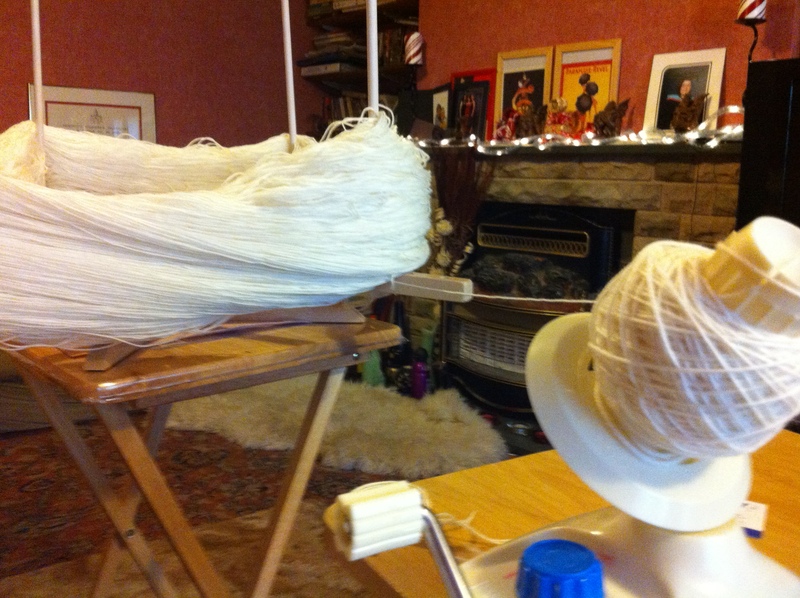 This is the wool, just on the swift – you can jusssst see the wool coming off it, near the bottom right hand corner… And this is the wool as it was wound onto the winder… And this is the result – 13 cakes of wool! 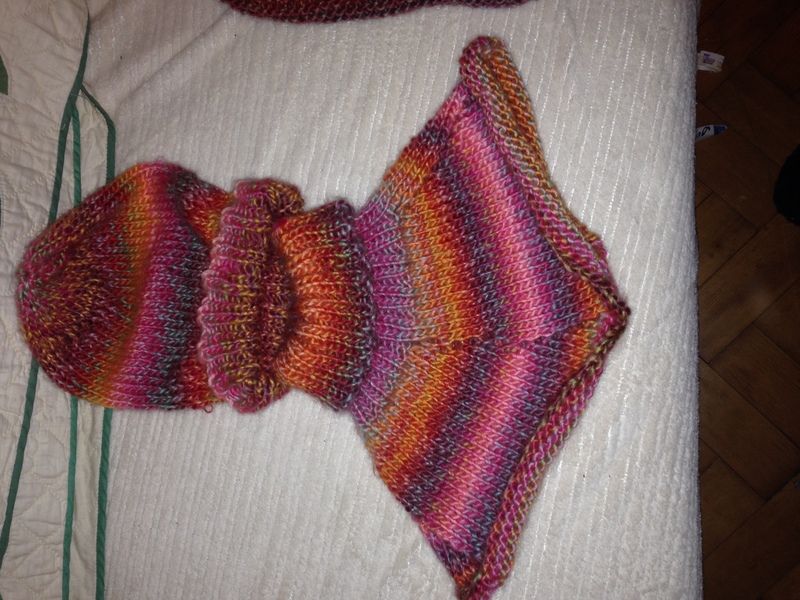 I’m itching to get to it – but there are other things on the needles (a mohair scarf, downstairs, and a Moebius scarf in double knit up here). 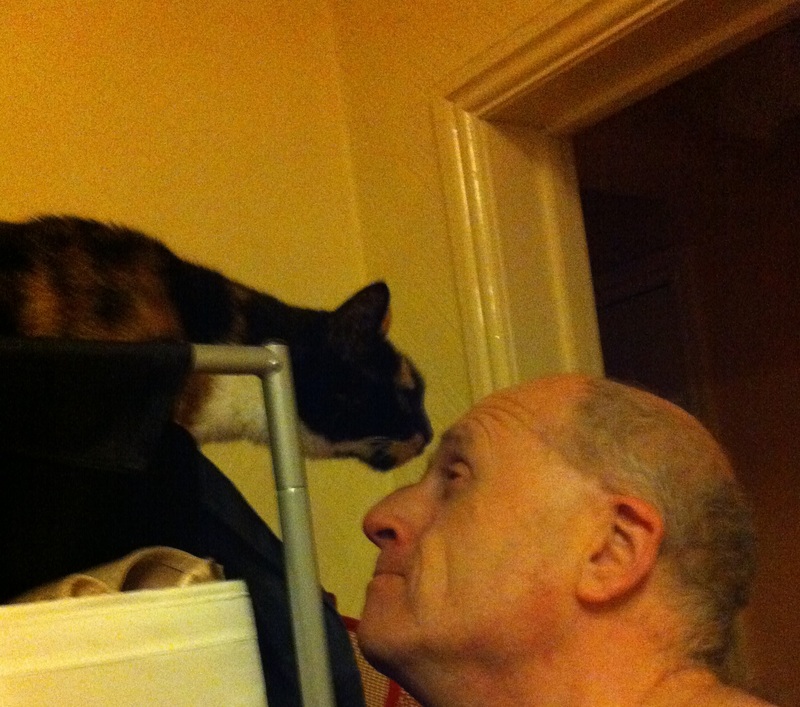 I shall be patient – after all, there’s a LOT of it! 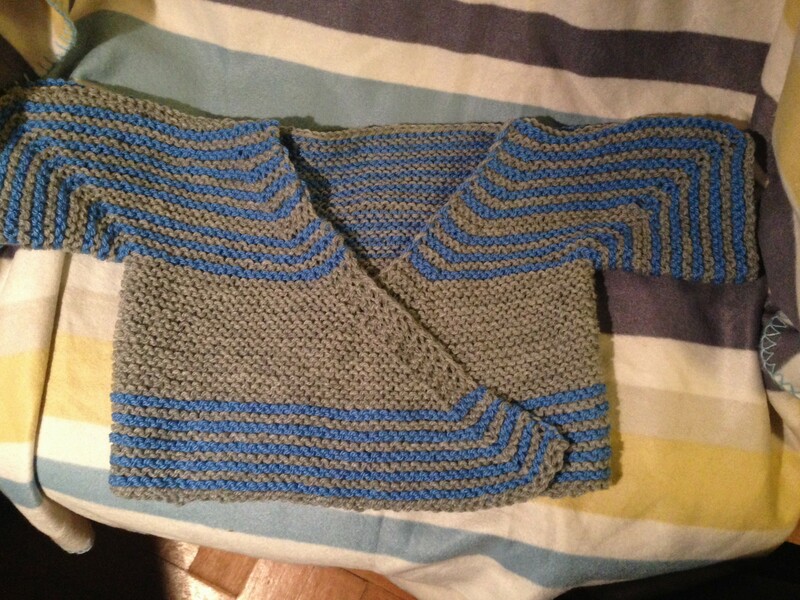 Double knit feels so big! 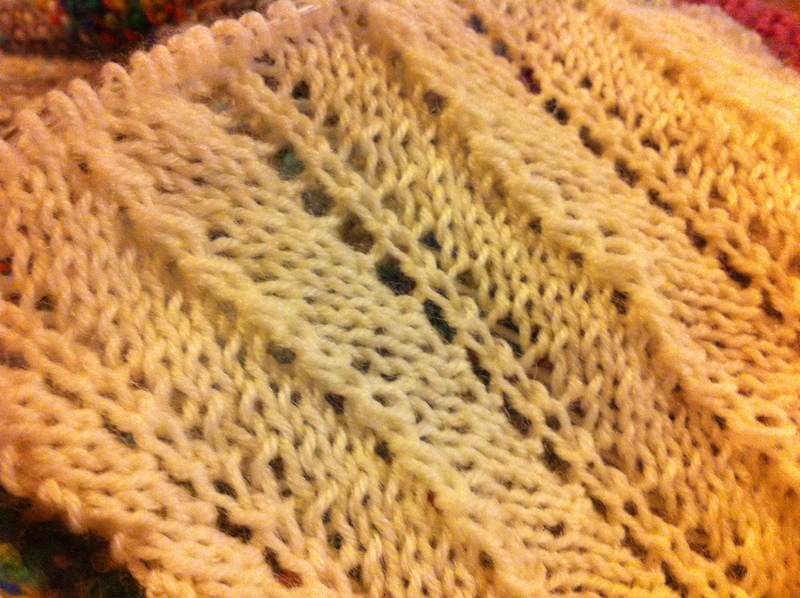 The shawl is, as one would probably expect, as it’s “upstairs” (and therefore, mindless) knitting, in Old Shale. 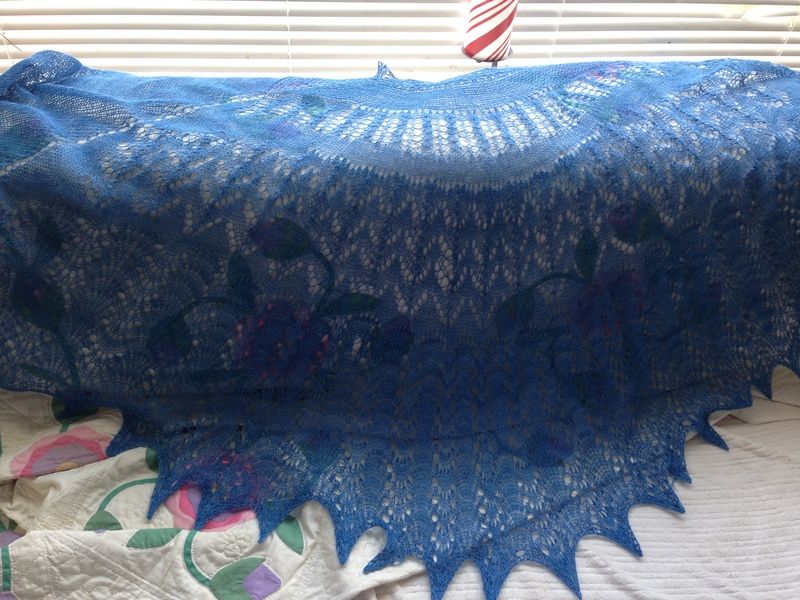 But it feels so BIG, after all that lace knitting!